Abu Dhabi: The National Investment Corporation (NIC) has awarded a more than Dh1 billion-contract to Arabtec Constructions LLC, to carry out the main construction of the Fairmont Abu Dhabi hotel and serviced apartments. Under the contract, Arabtec will build the hotel and apartments, maintain the project for one year, and maintain electro-mechanical works for two years after completion and delivery to the National Investment Corporation. The project is expected to be completed within 30 months. “Arabtec has a long record of completing landmark projects, thus it has been selected for its track record and experience in the development of luxury towers, a selection that we expect to be a success, which would further boost avenues of cooperation towards broader horizons in future,” Dr. Shaikh Sultan noted. 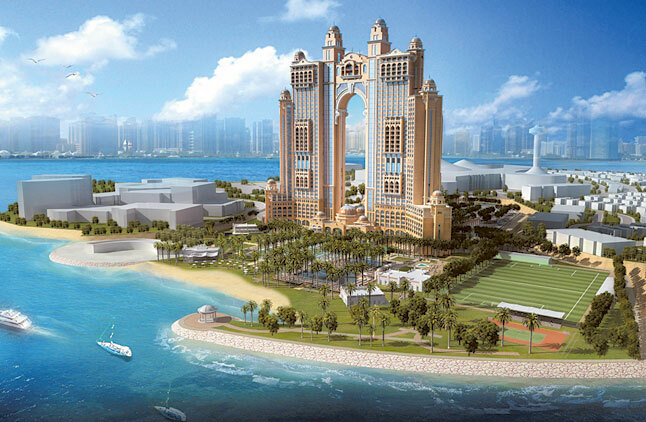 “The hotel will be one of the most luxurious hotels in Abu Dhabi by 2016. Our expectations are based on facts that derive from the hotel’s unique design that will constitute an architectural addition for Abu Dhabi. No doubt the selection of Arabtec to carry out works on the project is attributed to its vast experience in development of towers in the country and the Gulf region, especially The Burj Khalifa, ADIA Tower and Emirates Palace,” said Abdullah Al Sa’adi, Managing Director NIC. The Fairmont Hotel and Apartments Towers are owned by the National Investment Corporation. Managed by Confluence Project Management, the project’s design was finalised by Dewan Architects and Engineers. The project occupies an overall lot area of 155,000 square metres, and is located near Marina Mall in Abu Dhabi. Most guest rooms will have unobstructed breath-taking views of the Corniche and the skyline of Abu Dhabi city. The project involves the construction of a 39-storey tower with a total built-up area of 178,000 sq. metres, composed of 563 rooms and 249 apartments, 13 food and beverage outlets and 1,394 parking lots. “Undoubtedly, granting the contract to develop the Fairmont hotel project will add significantly to the company’s portfolio and record in the UAE. As we thank Dr. Shaikh Sultan Bin Khalifa Al Nahyan, Board Chairman of the National Investment Corporation, and all board members, we would like to emphasise Arabtec’s ability to complete the project, leaving its recognised architectural signature that will make the hotel and apartments towers a landmark in Abu Dhabi,” said Hassan Abdullah Ismaik, Managing Director of Arabtec.